We’ve been talking about The Shops at Target for months, but for those of you who remain unacquainted, here is what you need to know about the new design platform’s five boutiques, shop owners and their upcoming collections: The Candy Store, Polka Dog Bakery, Cos Bar, Privet House and The Webster. Soon enough, the masses will get to know each shop in a new commercial, airing this Sunday, April 22. 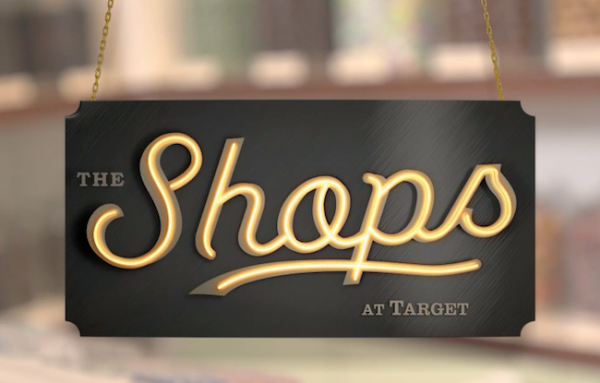 That’s right—The Shops are getting the VIP treatment with their very own Target commercial. Take a sneak peek at the spot below. Below, we chatted with some of the Target marketing gurus—Kim and Michelle —behind the TV spot and shop documentaries. Target has always been known for innovative ad campaigns. What was your inspiration behind The Shops documentaries and TV spot? Each shop owner is so unique: their background, the inspiration behind their store, where their store is located—all of it. We wanted to bring their individual stories and locales to life. Our creative direction was to highlight each owner and the shop location, to make “the shop” its own character. We spent one day with the owners in their shop, and another day wandering around their city documenting what they said they loved about where they work. We listened to what the shop owners said, and they made our job easy! What was your role in the documentary development? Kim: As Executive Producer, my role was to be the main point of contact to our partners. I translated the strategic objective and worked with my internal partners to determine the best team and crew that would produce the highest level of content for this campaign. Michelle: I was the Producer on the project. I worked directly with each shop owner, conducting pre-production interviews that allowed us to put a shooting plan together for each city. I oversaw the 16 days of travel in December for the entire crew and conducted the on-camera interviews with each shop owner. I worked with the art director and production crew to plan out our documentation day in each city. What do you hope people feel or remember about the TV spot? Our goal was to give everyone a glimpse into the daily world of these shops. We hope that every guest feels connected with the individual aesthetic of the boutique owners. It’s really their words telling the story behind The Shops concept. How did you balance telling the individual shops’ stories while making sure they meshed with the Target brand? Target is always focused on the guest. When conducting the interviews, we made sure to let their true story come through. Each shop owner had a different backstory so the answers to all the questions were very different. Except when we asked, “What was it like working with Target?” To that question, each owner had the same answer. They all said they loved working with Target and they couldn’t believe what an effortless collaboration it was. It was easy to make that answer work! What products from The Shops at Target are you most excited about? Michelle: We both have dogs so of course anything from Polka Dog! The shoes from The Webster are so fun. Kim: Privet House has some gorgeous throw pillows. And the false eyelashes from Cos Bar will bring out my inner diva. Michelle: And we can’t get enough sugar—the retro-candy boxes from The Candy Store will be all over our cube area!